Autumn: It´s a Game of Three Halves! Even though the intense heat of summer has now passed, the throngs of August tourists have finally returned home, the evenings are getting darker just that bit earlier, and the X Factor has returned to our TV screens – nothing says “autumn” to me more than the start of the rugby season! When we lived in the north-west of England, we were season-ticket holders at Fylde Rugby Club, standing shoulder-to-shoulder with ex-England captain, Bill Beaumont, on the terraces at the Woodlands Memorial ground for every match. Season after season we stood in the rain and cold, with pride and passion, shouting support for our local club. But, when we moved to southern Spain and based ourselves east of Málaga, we thought our live rugby-watching days were over. Of course, we can still enjoy the excitement of the Six Nations tournament, or an emotionally-charged Haka performed by the mighty All Blacks, in glorious close-up on the huge TV screens in many of the local bars, but there´s nothing quite like watching rugby in the flesh, so to speak. 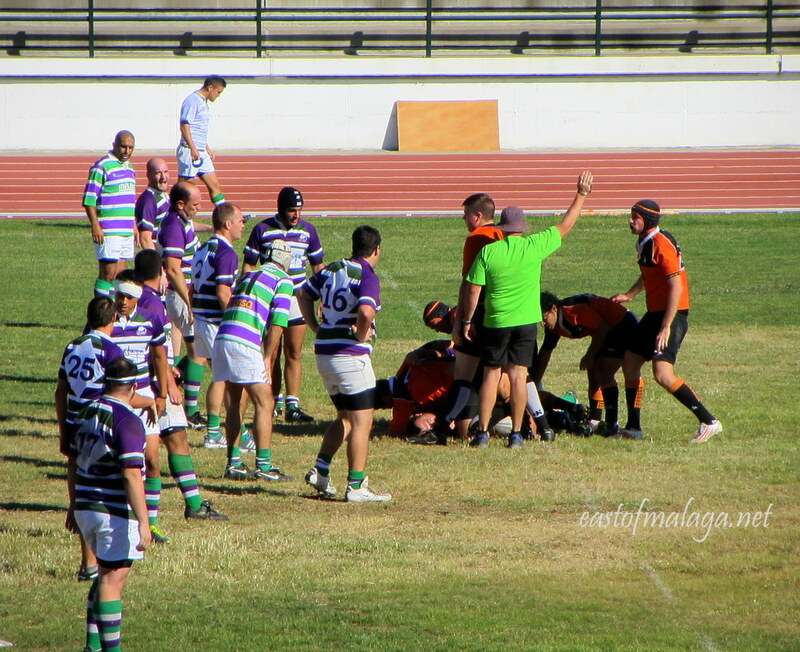 Imagine our delight when we discovered (by accident and at the last minute) that rugby was indeed alive and kicking in La Axarquía. 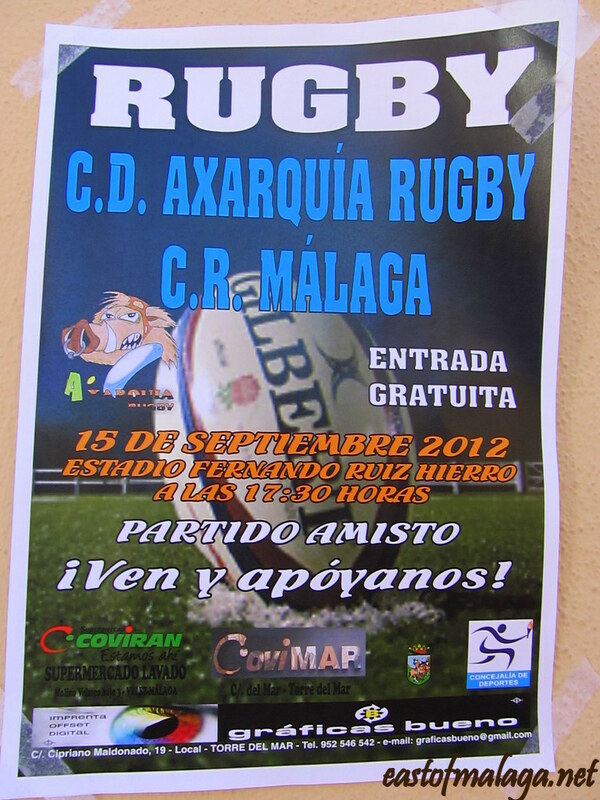 The poster advertised a match taking place between the Axarquía and Málaga Rugby Clubs at the Fernando Ruiz Hierro stadium in Vélez-Málaga on Saturday afternoon at 17.30, with free entry, so we went along to find out what it was all about. We witnessed a physical and entertaining game of rugby, fought out between two great rivals, in front of an enthusiastic and vocal crowd of around a hundred people. With squad members keen to impress their respective coaches ahead of the new rugby season, both teams put on a spirited display. Without a scoreboard, it was difficult to keep track of the points and, even though Málaga appeared to score more tries (and some of the conversions of both kickers looked rather dubious to me), it was eventually agreed by the powers-that-be, that a 33-33 draw would be a fair result! Well, it was only a pre-season friendly match. What was even more curious was that at the end of the second half, when we naturally presumed that the match was over, both teams congregated for another huddle on the pitch – and then resumed with a third half! At least this allowed more time for the players waiting on the Substitute´s Bench to take their turn to impress. 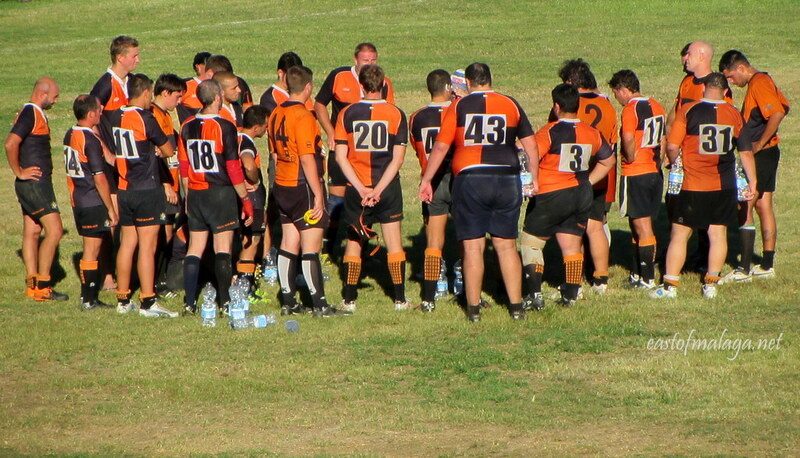 I later mentioned about it being “a game of three halves” to the club´s Press Officer, and when he sent me a copy of the Press Release yesterday, I´m sure you can guess the title of the article written for the Costa del Sol News – “Rugby Season Starts – It´s a Game of Three Halves!”. You read it here first, folks! 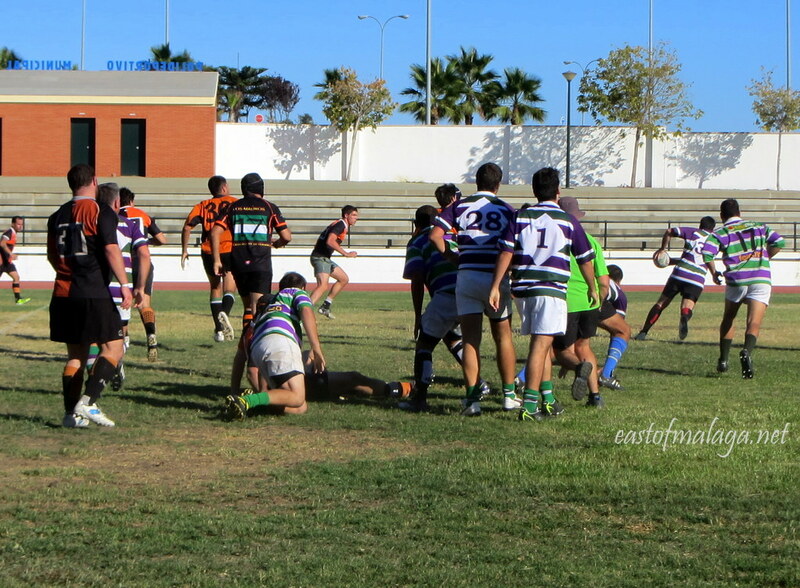 The Axarquía Rugby Club provided us with an afternoon of good sport, friendship and a club shop (well, more of a club table) selling cool drinks, tee-shirts and where social memberships can be bought for the princely sum of €15, which includes free entry to all games. We´ll be back to watch more of the fastest growing sport in Spain. This entry was tagged Andalucía, autumn, culture, East of Malaga, Europe, football, life, Malaga, rugby, Spain, sports, Sunday Post, Weekly Photo challenge. Bookmark the permalink. My husband played too, long ago. I could never understand how as he’s of the slender variety. Just happy he doesn’t make me watch it- I’m a Rafa girl (currently disappointed) Don’t like the game but applaud your thinking “out of the box”. Rugby is an exciting way to greet Autumn’s awesome changes. Amazing images! My son just started his soccer last Saturday. Nothing more fun than playing a game with a very enthusiastic team. Great post. These are great action shots! You really captured the physicality and intensity of the game! I loved this post 🙂 I grew up in a rugby town in country NSW – there was an avid following of rugby union & rugby league. Over the years some local players have gone on to do quite well. There is nothing like standing around a country oval on a nippy afternoon, drinking hot tea or coffee from a thermos, partaking of a pie, and soaking in the atmosphere, and then going to the pub afterwards! 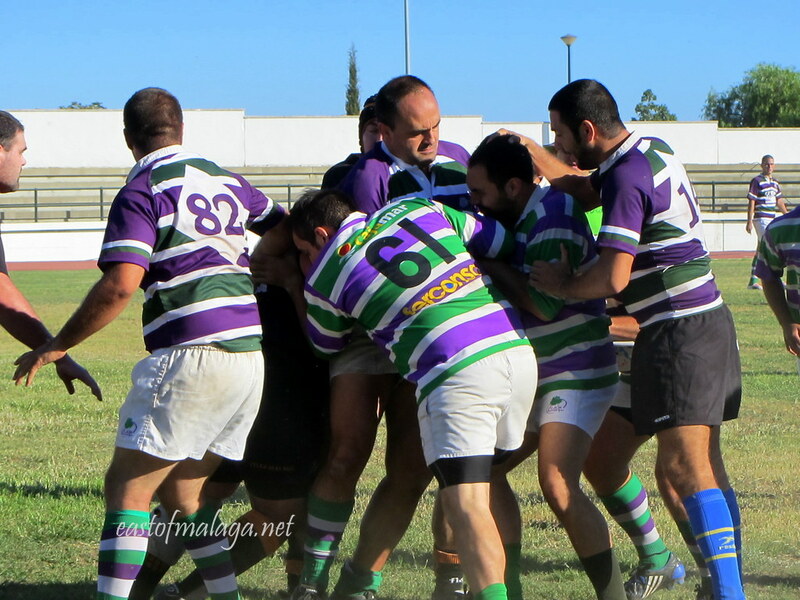 …and there is always such a fantastic atmosphere at a rugby match, isn´t there? No need to segregate opposing fans for fear of fighting each other – everyone gets on and there is great banter! Love rugby – shame we missed that! There´s lots of time – the new season hasn´t even started yet. When are you back in Andalucía, Tanya? Yes ladies, Haka is something different altogether … one has to admit boys in black are the best looking -:)))! It was a great game, AD! Everyone seemed to be posting photos of leaves changing colour, and I wanted to do something different! Like me, you´ll love the YouTube link then, to the Haka!